A creator of Peeple, the app that would let users rate one another, addressed the viral backlash against her plans Sunday in a post on LinkedIn. The project has been the target of widespread criticism over concerns it will prompt bullying and harassment. "The question I received the most is 'This must be a hoax. You're not seriously going to create this are you?' The answer is: It's real but not in the way it's currently being portrayed," co-founder Julia Cordray wrote. The social media profiles for Peeple have been disabled. But Cordray said she still plans to launch the app in November. "Now I'm going to use myself as an example for what can happen when negative comments can be made about you without your approval," Cordray wrote. Cordray said when Peeple launches, users will be able to comment only about others who opt in. And anyone on the receiving end of comments will be able to say yes or no to them. "Simply stated, if you don't explicitly say 'approve recommendation,' it will not be visible on our platform," Cordray wrote. Cordray wrote that it's a misunderstanding stemming from an interview she gave in which she "mistakenly" described Peeple as a "Yelp for People." "I've received death threats and extremely insulting comments aimed at me, my investors, and my family on almost every social media tool possible," she wrote. Posts on Peeple's website defended the project, saying it's meant to focus on the "good in people" and connect people with positive reviews. 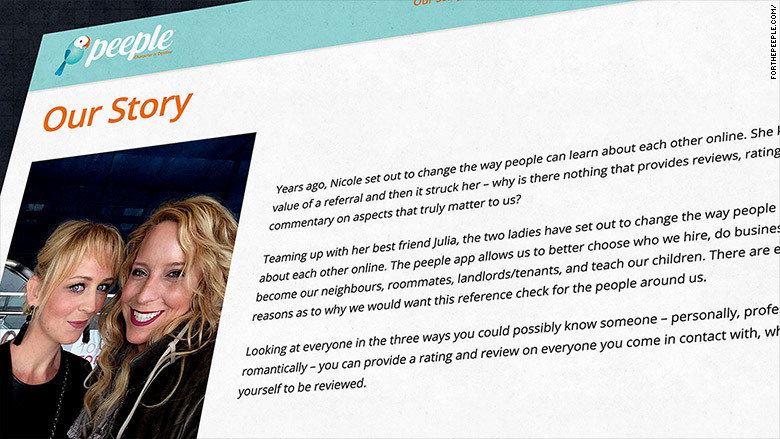 The app will allow users to rate people they know on three categories: personal, professional and dating. The developers said they won't be put off by controversy. An "ode to courage" was also posted on the site. "Whether you love us or our concept or not; we still welcome everyone to explore this online village of love and abundance for all," it says. --CNNMoney's Sara Ashley O'Brien and Ahiza Garcia contributed to this report.